Just as people have fears animals can equally be afraid of something new that they do not understand. Much like with children, to encourage fearlessness in your dog, you should expose them to different situations. There are many ways this can be accomplished safely. Here are some suggestions to get started combatting common fears for dogs. Have you ever noticed how slippery a tiled or hardwood floor can be? What if you were an animal coming into a home for the first time and grass, dirt or possibly carpet is all you have experienced for flooring? A dog that is used to the outdoors or carpet may be nervous around hard surfaces such as tiled, vinyl, laminate, concrete or hardwood flooring. If your puppy or adult dog is afraid to walk on a hard surface, try walking your pet on lead into the room and around the entire house with confidence and without hesitation. Once your pet walks over the hard surface a few times on lead, he should start to understand the floor is not as tricky as it seems. Should your dog still need encouragement, try placing vet-approved treats around the room(s) in question. Patiently walk across the room and call your dog from the opposite entryway. Respond to each treat he locates with lots of praise, pets and positive reinforcement. Your dog will respond more to praise and pets than frustration. Did you know a new smell or sight could cause a puppy to be nervous about eating? This includes his or her food as well as the bowls and stands you use at feeding times. The best trick to combat this fear is to be consistent with the food you select and show him varying types of feeding bowls. Not sure which food to buy? There are reviews on most brands on the Dog Food Advisor, and it is always a good idea to ask your vet about some of the brands you want to try. Be sure to include high levels of audible praise when he eats from each bowl. One note of caution- if the dog is a puppy, mealtime is a wonderful opportunity to to establish the pecking order. Picking up the dish temporarily as the puppy eats and asking the puppy to sit before being released to eat are two great ways to show dominence. Adult dogs who grow up learning you are the pack leader will not show aggression at meals, and you can offer petting praise at your discretion while they eat. However, adult dogs that do not view you as the leader of the pack can have an aggressive reaction to such games. Ensure your safety and that of any children or guests by keeping a "no-touching rule" during feeding times. Routine walks at the same time each day are wonderful chances for both removing any anxiety with exercise and helping you bonded together. When you see through the eyes of a dog who is scared and focused on the owner for assurance, you can see how the owner's expectations and attitude are key for a pleasurable experience. Remaining confident and calm while expecting good things the entire walk is important. Before you walk, ask your dog to sit. Wait until your dog calmly sits by command before attaching the leash. A calm state is your best friend with tackling any new environment. Once your dog is calmly sitting with the attached leash, give the command to walk as you take that first step together. Avoid giving commands in a timid manner. Dogs want to please you. But, like children, they will test their boundaries when they think the command is more of a question. As you walk, offer calm praise whenever you feel your dog is behaving well under new circumstances, such as meeting other dogs or children. It also does not hurt to keep some treats handy for rewards along your walk when you think the reward is deserved. Try to avoid petting your dog when he acts fearful. This can reinforce he is right to be nervous. Instead, act as if all is well by keeping your regular pace. 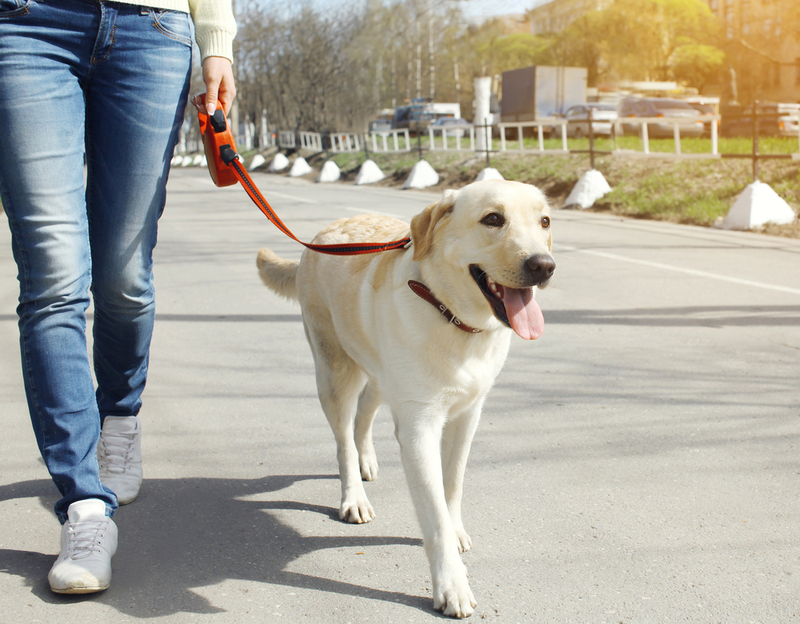 Should he continue to exhibit an unwanted behavior, ask your veterinarian for more training tips because walks are important in caring for your furry friend and should be enjoyed by both dog and owner alike. Walks are perhaps the most useful tool in establishing courage for your dog when it comes to loud sounds too. He can feel bold on walks because you are on the other end of the leash walking side-by-side with him. That stroll opens his world to child laughter at the parks, sirens and car horns along the road, and perhaps even construction equipment. The more sounds your dog hears with you by his side walking a comfortable pace for him in a confident manner, the more he will realize these sounds are "normal" and nothing to fear. You can do a lot to encourage your dog to explore the world around him, which is full of new sights, sounds, tastes and textures. It starts with something simple such as walking inside the house, switching up mealtime containers, or taking a stroll outside. Remember the dog will mirror your emotions and look to you for assurance. So, stay upbeat and positive through the setbacks as you expect each new experience to be a great one!